Note: This text was composed by our colleague Purushotham Venkatesh of Alukov India. "Indian Fleet Review" is a once in 5 years Indian Navy event conducted once in the east coast and the next time in west coast. 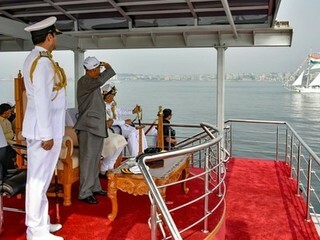 In India, the President, as the Supreme Commander of the armed forces, reviews the Fleet once during his tenure. Ten Reviews have taken place in India since Independence in 1947. 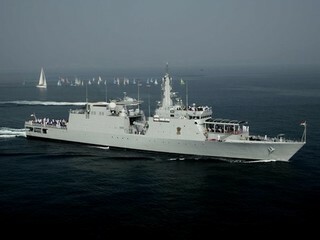 The first was held in 1953 and the last prior to "International Fleet Review" 2016, in 2011. After a number of ceremonies ashore, the President’s Yacht steam past an impressive array of ships of both the Indian and merchant navies and the Coast Guard, which together symbolize the country’s maritime strength. The Indian Fleet Reviews varies from that of some navies of the world, where ships steam past the reviewing yacht or ship. In a tradition inherited from the Royal Navy, the President inspects the navy to ascertain its strength and reaffirm his faith in its readiness to safeguard the nation’s maritime interests and its security. 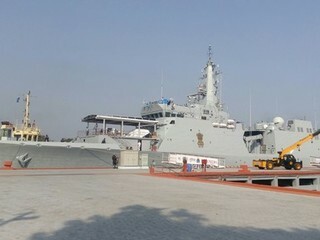 It was not easy to get a prestigious order from the Indian Navy, for the first time and that too for an event of such a large scale. We got a call from 2 officers from 2 different departments of the Naval Dockyard. Both found us on the net and called me for a meeting, to know more about our products. Indian Navy was looking out for such a Retractable Roof for the past 1 year. Luckily, we were in talks with another department of the Government of India for a similar Retractable Roof for the "Republic Day Parade". They could not finalize the order yet, due to various reasons they know better. When we showed the rendering we had proposed, both the officers were impressed and then the talks started progressing. Later after we sent the offer, they did their own search through out the world and came to a conclusion that we were the best and only - Alukov Roofs withstood 125 km/hr wind speeds. Some other manufacturers in Europe and Australia referred to Alukov only when they were inquired. Hence they placed the order on us and lifted the material by Air, so that they have enough time for trials on the sea before the final event. We could not have used the solar powered motor, because of the heavy winds on sea. So we designed a special system and it was partly successful. The time consumed while Roof opened was 68 seconds, while Roof closing took more than 300 seconds, due to resistance from the winds in high seas. There was a slip of wire rope on the motor pulley. Later we changed the system and adjust the ratio of the wire rope and a pulley (to reduce the friction and also the weight of the steel chain) and the steel chain and a sprocket at the other end. After this change, the trials showed 64 seconds opening and 64 seconds while closing. We also gave steel retainers so that high winds would not lift the segments. The ship was steered to its maximum capacity to test the retractable roof at worst conditions. I was witness to it. 25 nautical miles was the speed, with the wind load above that. Almost for 3 weeks, this exercise was continued on alternate days. The naval officers were satisfied and very much happy that Alukov proved that its the best in quality. We used a special 3M sun film on the inner side of the polycarbonate sheets to reduce the heat. After the event, we have an agreement that we remove the Retractable Roofs from both the ships and store in a secure place they allot inside the dockyard. Later after they identify the place on the ground, we have to install these 2 Roofs again. (may be a staff quarters or a restaurant area). This is how we have set a world record of sorts for: "The First Retractable Roof over a 2200 ton ship"